Following the Spanish-American War of 1898 and the Russo-Japanese War of 1904-1905, warship designers began to question the standard battleship design followed by every major navy: a pair of heavy guns in each of two turrets, sited fore and aft, and a number of light guns for protection from torpedo boats, usually placed in an armored casemate amidshps. Spain built her naval power around a squadron of relatively fast armored cruisers, destroyed off Santiago de Cuba by the American fleet. A high rate of fire at close range made the difference for the Americans both off Santiago and in Manila Bay. Some designers drew from this the conclusion that a powerful medium-caliber battery capable of very rapid fire would overwhelm a ship with a smaller number of heavier guns. Each hit from the heavier guns might do more damage, but the sheer number of hits by smaller shells would more than balance this out. The Russo-Japanese War seemed to teach a different lesson: Battleships of both sides survived enormous numbers of medium-caliber hits, and at the longer ranges seen at the battles of Tsushima and the Yellow Sea, spotters had difficulty distinguishing the splashes of heavy- and medium-caliber shells. The answer here seemed to be a ship armed exclusively with heavy guns. Siegfried Popper’s “ideal battleship,” SMS Radetzky. At the turn of the century, heavy warship design was dominated by a handful of powerful figures: Sir William White and Philip Watts in Britain, Siegfried Popper in Austria-Hungary, and Benedetto Brin and Vittorio Cuniberti in Italy. All of them at first heeded the lessons of 1898 and began to incorporate very large batteries of medium-caliber guns in their designs. Later known as “semi-dreadnoughts,” these warships packed huge numbers of 8-inch to 10-inch guns in amidships batteries, usually in turrets for faster and more accurate fire. White’s King Edward VII class, designed in 1902, replaced the dozen 6-inch guns of the previous classes with four 9.2-inch and ten 6-inch guns. For the next class, the Lord Nelsons drawn up in 1904, the 6-inch battery was abandoned altogether and the ships carried ten 9.2-inch guns — in both cases, all the 9.2-inch guns were mounted in turrets. The ships retained the main battery of four 12-inch guns, in turrets fore and aft. Popper designed the Radetzky class to similar standards, with four 12-inch guns and eight 9.4-inch guns, all in turrets. The American Virginia and Connecticut classes mounted eight 8-inch guns in turrets; the Russian Imperator Pavel I had fourteen of them in a mix of turrets and casemate mounts. Regina Elena on speed trials. Cuniberti, however, had different ideas. In 1899, the Royal Italian Navy charged him with designing a fast armored cruiser armed with a dozen 8-inch guns. Before those drafts had been completed, the navy changed the requirements to a fast battleship that could outrun any French or British battleship but would be more powerful than any of their armored cruisers. The Regina Elena class, very handsome ships, easily met the standards. They carried a pair of 12-inch guns, in single turrets fore and aft. Amidships they mounted three twin turrets on either side for 8-inch guns. At 12,500 tons, they could make 21 knots. As part of the design study, Cuniberti also drafted a 17,000-ton version. An much enlarged Regina Elena, this ship was designed for 24 knots and replaced the six medium-caliber turrets with more 12-inch guns: a double turret on each side of the ship, flanked by single turrets. The total of 12 12-inch guns made the ship much more powerful than anything else afloat, with a broadside of eight big guns against four for any other battleship. With her speed she could run down almost anything else afloat. Her profile was very similar to the fast pre-dreadnought, with a fourth funnel due to the much larger power plant. Cuniberti suggested the ship for the Italian Navy’s 1902 program, but the navy ministry balked at the enormous cost and ordered a second pair of Regina Elena class ships instead. The designer requested and received permission to publish an article about the design in the 1903 edition of Jane’s Fighting Ships. Cuniberti’s ship could not have made the claimed 24 knots on 17,000 tons; the horsepower required would have meant much larger machinery (increased speed increases power requirements exponentially). But the armament and protection he outlined would have given Italy a powerful warship well capable of the tasks he foresaw even at 20 or 21 knots. Cuniberti’s article appeared just before Sir John Fisher took over as First Sea Lord and began a radical restructuring of Royal Navy shipbuilding. Though often credited with igniting the Dreadnought era of battleship construction, Cuniberti’s ideas were the logical outcome of naval developments around the world. The Japanese Satsuma class designed immediately after the Russo-Japanese War originally would have mounted a dozen 12-inch guns, but shortages of heavy artillery forced the replacement of eight of them with 10-inch pieces instead. During his time as commander of the Mediterranean Fleet, Fisher had already solicited preliminary sketches of all-big-gun battleships from his crony W.H. Gard, chief constructor of the Malta Dockyard. These featured 12-inch guns, but Fisher at first was more attracted to a design that Watts, who replaced White as Chief Naval Constructor, had prepared for Brazil while he’d worked at the private shipyard Armstrong’s. The Brazilian battleship carried a dozen 10-inch guns, a new model Armstrong’s had developed in its new cannon foundry capable of a rate of fire three times that of the standard 12-inch gun. Watts believed he could design a battleship mounting sixteen of them were he granted a displacement similar to Lord Nelson. Fisher’s beloved old flagship HMS Renown had carried 10-inch guns and the admiral still thought a well-drilled crew with the lighter but faster weapon would defeat an opponent with heavier but slower-firing guns. A “Committee on Designs” appointed by Fisher recommended that the new ship retain the 12-inch gun, with no medium-caliber guns and a speed of 21 knots. Watts delivered five design sketches; the committee found objections to all of them, mostly on the grounds of turret layout that masked the fire of many guns. Frustrated, Watts handed in a design for an enlarged Lord Nelson with eighteen 9.2-inch guns. Again rejected, Watts came back with much more feasible designs in January 1905. Dreadnought is launched, February 1906. The committee pondered two finalists. Design G, a 21,000-ton ship with the traditional expansion engines, used the “hexagonal” turret arrangement of Watt’s armored cruiser designs for Armstrong’s that would be adopted by the German navy for its first all-big-gun battleships. Design H was much smaller, a 17,850-ton ship with only ten heavy guns, but giving the same broadside firepower thanks to better arrangement of them. Most of the weight saving came from the radical adoption of Parsons turbines, until then only used in smaller ships. 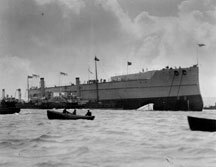 The committee chose Design H; she was laid down as HMS Dreadnought in October 1905 and completed in December of the following year, a building time considerably shortened by stockpiling of materials during the design phase. Even so she had been designed and built far too quickly and displayed a number of flaws; she spent most of the Great War operating with the pre-dreadnoughts of the King Edward VII class and was considered worn out before the war was over, just a dozen years after completion. Watts’ Dreadnought changed the course of European power politics; had she been built by the Italian Navy, Cuniberti’s would likely have done so as well. Such a powerful ship in Italian hands would have demanded a British response and likely driven Italy firmly into the Central Powers camp, changing the course (and possibly the outcome) of the First World War. 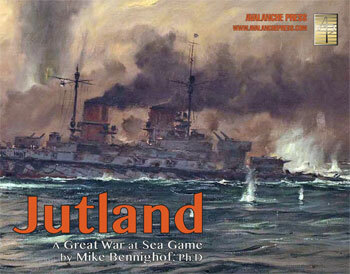 Dreadnought and her siblings appear in Great War at Sea: Jutland; Regina Elena and hers in Great War at Sea: Mediterranean Ultimate Edition.